Quite often, big improvements occur when we look at something we took for granted in a new light. Take ventilation systems in commercial kitchens, for example. Traditionally there have always been two assumptions. One, the place where you cook needs to have a hood. Two, that hood must be placed above the cooking area. Evo challenged these rules, and developed the award-winning EVent 35E and 48E cooking stations. They are electric griddles with an integrated downdraft ventilation system placed right where the action is: at the cooking-surface level, just to the side of the chef. The system captures steam, grease, and smoke and puts them through a 4-stage system: a grease filter, a particulate filter, an ESP (electric static precipitator), and a charcoal filter to remove any odors. The exhaust is placed near the bottom on the same side. EVent 35E & 48E are 24”-wide with a length of and 35”and 48” respectively. The station incorporates four patented microheaters and a self-contained fire suppression system. The 48E version also includes an optional wooden dining table. Evo put kitchen ventilation -- quite literally -- in a different perspective. Restaurants, resorts, sport arenas and stadiums, grocery stores, and hospitals: All types of foodservice operations can create new dining experiences front-of-house or wherever it wouldn’t be possible or cost-effective to have a ventilation system. 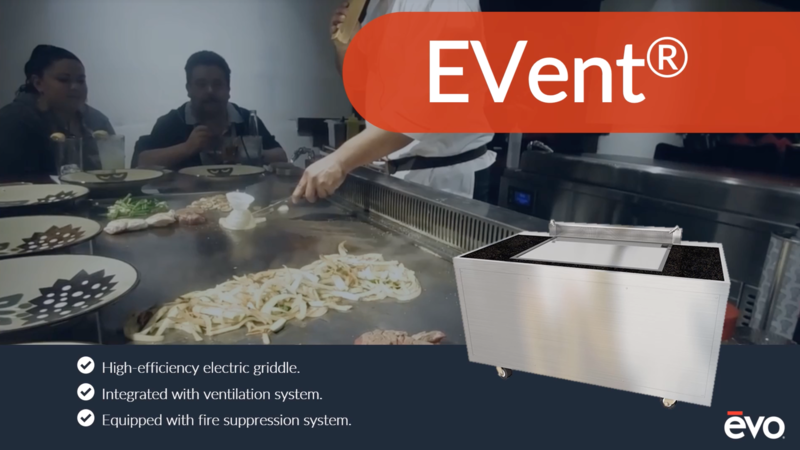 Learn more about the Evo EVent griddle, or even better, see one in person. Schedule an equipment assessment with your friends at Eaton Marketing.